SAN FRANCISCO -- San Francisco police say a suspicious device found in the city's Castro District Wednesday afternoon has been deemed safe. A San Francisco sheriff's deputy spotted the suspicious object on top of a newspaper rack on the southwest corner of 17th and Noe streets around 11:15 a.m., according to police. The area around 17th and Noe streets was shut down and residents were advised to avoid the area, police said. 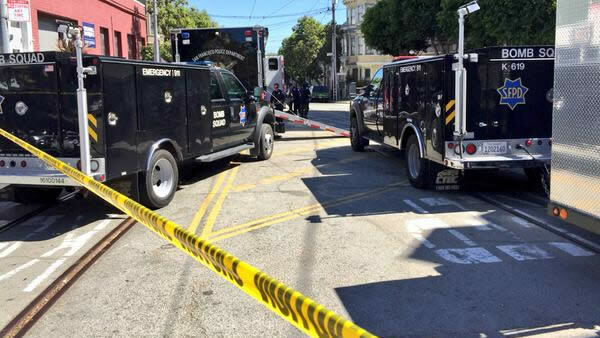 The department's bomb squad responded to investigate the suspicious object and an unattended bag found nearby in the 300 block of Noe Street, police said. Police spokesman Officer Albie Esparza said on Twitter shortly after 1:20 p.m. that there was no danger from the suspicious objects and that police were leaving the scene. The street closures affected the F-Market & Wharves streetcar line, police said. The 24-Divisadero, 35-Eureka and 37-Corbett bus lines were also affected, according to the San Francisco Municipal Transportation Agency.